Egypt has closed the Great Pyramid outside Cairo after rumours that groups would try to hold special rituals on 11 November at 11:11 (09:11 GMT). The rumours sparked an internet campaign to stop any ceremonies. However the head of Egypt's antiquities authority said the pyramid had been closed until Saturday morning for "necessary maintenance" only. The Great Pyramid houses the ancient tomb of the Pharaoh Khufu. Two nearby pyramids and the Sphinx remained open. Security was tightened across the entire complex, Associated Press news agency said, with dozens of police officers and armed soldiers on patrol. 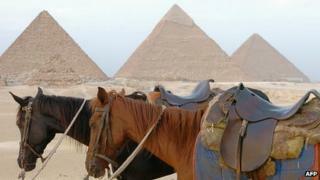 After 11:11, the director of the pyramids complex, Ali al-Asfar, said nothing unusual had happened. "Everything is normal," he told AP. "The only thing different is the closure of the Khufu pyramid." Both he and the head of the Supreme Council of Antiquities, Mustafa Amin, said the pyramid was closed for maintenance after the large number of visitors during the Eid al-Adha holiday last week. Reports of planned ceremonies at the site were "completely lacking in truth," Mr Amin said. But the rumours had sparked an internet protest campaign to block any rituals "within the walls of the pyramid on November 11, 2011," Atef Abu Zahab, the head of the Department of Pharaonic Archaeology, told AFP news agency. The pyramid is the biggest and most famous of the Giza monuments and is the last of the seven wonders of the ancient world still standing. Numerologists have been excitedly awaiting the alignment of ones on Friday, believing the date holds special significance. Hospitals have reported a surge of bookings for Caesarean births and wedding venues have been having a busy day as well.